Dogs need to be walked in winter; however being aware of the dangers and symptoms prevents problems. Tolerance for the cold depends upon your dog’s coat, age, size and health status. 2. Discomfort or anxiety. Your dog stands around, tries to run home, or looks for a place for shelter, like under a parked car or in your garage. 3. An unusual posture. Your dog may display a hunched posture with tail tucked, or lift his or her paws uncomfortably off the ground. 4. Whining, crying, or barking. This is how your dog tries to communicate with you. 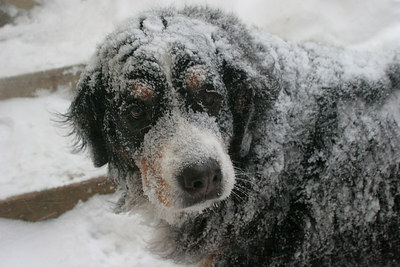 Periods of exposure to the cold, which can be short in current temperatures, can cause your pet to suffer hypothermia. Wet skin and fur can hasten this process as well. 5. Weakness, lethargy, muscle stiffness, and slowed breathing are life-threatening. Wrap your pet in a warm blanket and get to a veterinarian as soon as possible to prevent complications, coma, or death. Frostbite usually affects the areas of the body least protected, such as toes, ears, tail tips, and the scrotum. 1. Pale or grey skin that is cool and sometimes hard to the touch. 2. Red or swollen areas, which may begin to peel. 3. As your pet's circulation returns it may be very painful for your pet. Dead skin and tissue separates from the body in one to three weeks. It is important not to rub or massage your pet’s affected area. If you suspect frostbite, wrap your pet in a warm blanket and get to a veterinarian as soon as possible. You wouldn’t sleep outdoors in this weather, and neither should your pet. Keep all pets indoors during extreme weather, unless limited and supervised. 1. Take shorter walks, and never leave pets unattended. 2. Rinse and dry paws after coming indoors to prevent problems from ingesting ice and rock salt. 3. Dry off your pet’s fur and/or sweater. 4. Consult with your veterinarian about your pet’s diet, but sometimes extra calories help reduce heat loss. 5. Keep your pet away from antifreeze. It tastes sweet, but is highly toxic. Give your pet fresh water at all times, since a thirsty pet will seek liquids such as antifreeze. Exposure to antifreeze may include lethargy, lack of coordination, weakness, depression, vomiting, diarrhea, inability to urinate, and gastric ulcers. Immediate treatment by a veterinarian is crucial. 6. Painful arthritis flares up in winter. Ask your veterinarian about supplements to help joints.